Att’d. 3rd. Bn. Worcestershire Regt. Jesse was the son of Henry Atkin & Fanny Atkin residents of School House, Westwood. Jesse’s father, Henry, who was a railway signalman, originated from Loughborough, Leicestershire. His mother Fanny (nee Auckland) was born in Sedgebrook, Lincolnshire, as was Jesse’s eldest brother Harry. Fanny and Henry married in Newark in 1876. By 1881 they had set up home at Old Westwood, Westwood, Notts and had three children. By 1891 they had moved to the then newly-built New Westwood and could be found still there on the 1901 census and remained there until at least 1915. The Census of 1901 lists the family as follows – Henry (50), Fanny (51), Harry (24) a railway goods clerk, Charles Alfred, a Grocer’s Assistant (20), Helen (18), Amy (16), Arthur (12), Jesse (9) and Bertha (3). 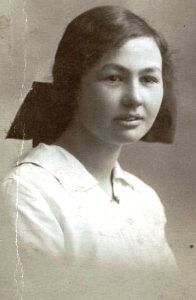 Jesse had another sister, named Edith, aged 22 who had left home by 1901. The 1911 Census shows Jesse still at New Westwood aged 19 and he is described as a ‘normal student’. His sister Bertha is the only sibling still at home aged 13. By this time Mary Auckland aged 62 had come to live with the family and she was Jesse’s aunt and was a nurse (domestic). 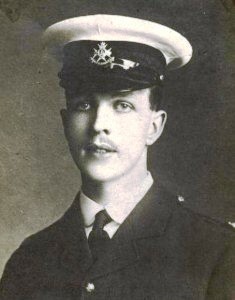 A fuller article in ‘The Ripley & Heanor News’ entitled “Codnor Park Lieutenant Killed – A Distinguished Scholar” reports “On Monday, the parents of Lieutenant Jesse M Atkin, Sherwood Forester of Jacksdale, received a message informing them that their son had been killed and expressing Lord Kitchener’s regret and sympathy. Deceased, previous to going to the front, was engaged in scholastic work at Bournemouth. He was 23 years of age and stood 6ft 4 inches high. 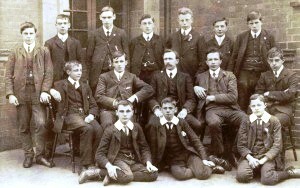 Lieutenant Atkin was the son of Mr H Atkin, New Westwood and entered The University College, Nottingham in the session 1910 –11. Whilst at college he passed the final examinations of the Bachelor of Arts Degree of London. He received his military training under Captain Trotman in the Officers Training Corps, passing ‘A’ and ‘B’ Military examinations. At the completion of his college career he applied and was accepted for the special reserve of officers. A touching incident in connection with the announcement of his death was that his sister, who is engaged in the Jacksdale Post Office was the one to receive the sad message”. We have since been informed by Jesse’s family that it was his sister Bertha, who worked in the Jacksdale Post Office. Jesse’s other sister Amy was a local school mistress. Photo: Thought to be taken at Bournemouth, where Jesse had a position as a school master. 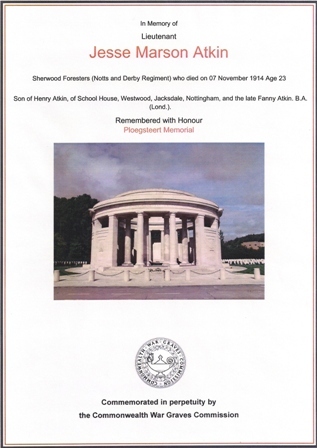 The Atkin family lost two sons to the Great War as Jesse’s elder brother, Charles Alfred Atkin, a Private serving with the South Staffordshire Regiment, was killed in action on 30th May 1918. Jesse’s parents are buried in the church cemetery at Westwood, St Mary’s. His mother Fanny died on 1st December 1924, aged 72, which indicates that she would have been 39 years old when Jesse was born. His father, Henry Atkin, died on 21st April 1928, aged 76. The family grave pays tribute to Jesse, with the inscription “who fell in action in Belgium”. It is interesting to note that the grave of Fanny’s sister, Mary Auckland an ex-ladies maid who never married, is close by, with the inscription “sister of Fanny Atkin.” We would welcome any further information about the Atkins of School House, Westwood, or about the Auckland family.